These are a Good Buy! 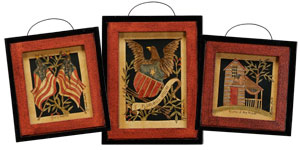 Three patriotic paper cutting prints in frames. What a beautiful way to display your pride in America in your home. Frames are wood with glass and are 4.75" x 6.13", 4.5' x 5" and 4.5' square. They are a rusty center with black with a wire top for hanging and a wood dowel for surface display. Choose your favorite!